The production of coloured shaded relief is possible by combining a series of printing plates containing different coloured inks. A single shaded relief (usually drawn in grey) is the starting point for photo mechanically producing multiple printing plates. Plate in blue-grey of medium strength for the main tone of the relief shading. Grey-violet plate as a supplementary relief shading tone. Light blue plate for hypsometric tints to reinforce shaded slopes and for lake surfaces. Yellow plate for ground and light toning. Extremely pale pink plate for rocks and high regions. Five different colour plates for the school map of the Canton of Grisons derived from a single grey-scale relief shading. From “Cartographic Relief Presentation” by Eduard Imhof (1982). The combination of multiple printing plates in different colours creates a unique map that is known as the “Swiss style”. 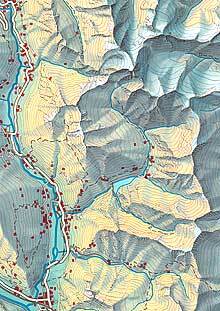 Section of the school map of the Canton of Grisons – with and without linear elements and rock drawing. Example of a “Swiss style”-map. 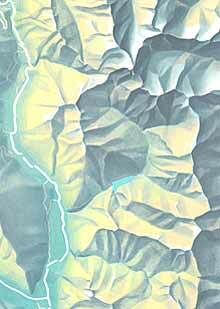 From “Cartographic Relief Presentation” by Eduard Imhof (1982).